If you’ve been searching for a high-performance sports sedan, look no further than the 2018 Dodge Charger SRT Hellcat. It’s by far one of the quickest and most powerful cars in the segment. While the Charger is built to deliver constant driving excitement, it still manages to offer great comfort on the road. A spacious interior and excellent crash scores make the SRT Hellcat a great choice for families. You also can’t overlook the Charger SRT Hellcat’s muscular styling. With so many great deals currently available, now is the perfect time to visit your local Dodge SRT dealership. Let’s take a closer look at this world-class performance sedan. Very few sedans have as much flair as the 2018 Dodge Charger SRT Hellcat near Westbury. Everyone on the road will notice the Charger SRT Hellcat’s menacing stance. A performance-tuned suspension makes it sit a bit lower to the ground. The sedan’s imposing grill gives it an extra intimidation factor. Meanwhile, wraparound headlights enhance its seamless design. To further enhance the Charger SRT Hellcat’s aggressive look, Dodge outfitted it with a functional hood scoop that maximizes airflow to the engine. The car’s rear-end is just as exciting. 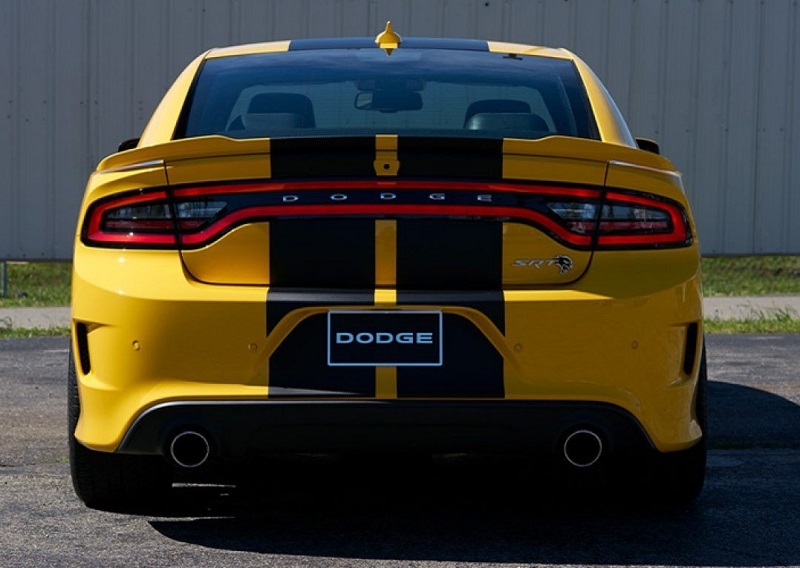 “Racetrack” LED taillights and an integrated spoiler help the Charger SRT Hellcat to stand out from the crowd. Dual exhaust outlets add the finishing touches. While the standard SRT wheels will satisfy most people, you have two optional wheel packages to choose from. The available Brass Monkey forged wheels will definitely cause onlookers to take a second glance. A black roof and special SRT stripes are optional. Some of the jaw-dropping exterior colors include Yellow Jacket Clear Coat, Redline Red Tri-Coat Pearl, Pitch Black Clear Coat, and Go Mango. Make it a priority to come see the new 2018 Dodge Charger SRT Hellcat! Your local Dodge SRT dealership will be more than happy to give you a detailed tour of this legendary performance machine. The 2018 Dodge Charger SRT Hellcat near Westbury has a roomy cabin that makes everyone feel at home. Even the backseat provides an enormous amount of legroom. Whether you’re cruising around town or taking a long road trip, everyone will experience a comfortable ride. You will also notice the Charger SRT Hellcat’s outstanding build quality. Heated and ventilated leather seats come standard. A large trunk makes this sports sedan even more rewarding. 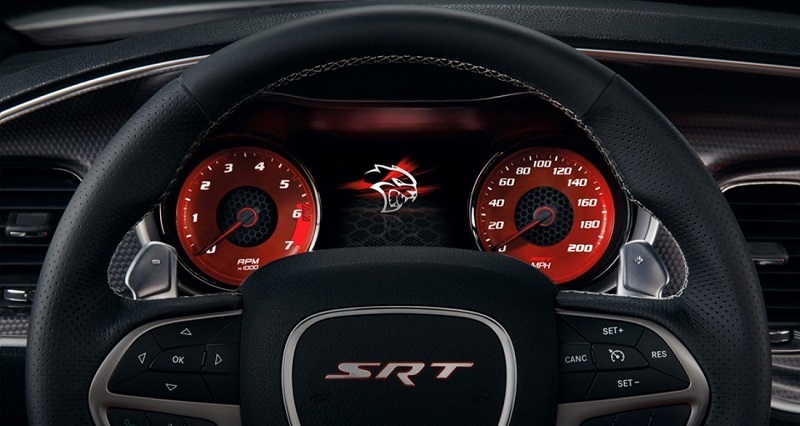 Exclusive SRT Hellcat badges add a special touch. While behind the wheel of the 2018 Dodge Charger SRT Hellcat, you’ll be surrounded by a number of premium components. Featuring an 8.4-inch touch screen with Apple CarPlay and Android Auto, the Uconnect infotainment system promises to leave you impressed. An exclusive SRT Performance Pages app makes it easy for drivers to access stats such as 0-60 times. You will also enjoy the sedan’s 276-watt sound system. Some of the other goodies include GPS navigation, Bluetooth connectivity, and a Digital Cluster Display. 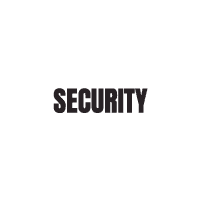 If you have any questions about the Charger SRT Hellcat’s available features, be sure to contact Security Dodge serving Westbury New York. In the 2018 Hellcat, you are provided with a supercharged 6.2L HEMI V8 engine that can produce an impressive 707 horsepower with 650 pounds-per-feet of torque. The engine is paired with a TorqueFlite eight-speed automatic transmission that provides you with optimal precision. Our authorized dealership on Westbury NY can provide you with further details about the powertrain that is featured with the 2018 Dodge Charger SRT Hellcat. The 2018 model comes packed with safety features that provide drivers and passengers with ample protection. A standard ParkView Rear Back Up Camera and the standard ParkSense Rear Park Assist System can let you know when an object in in your rear path when you are reverse. Another notable safety feature that comes with the new model is Full-Speed Forward Collision Warning with Active Braking. This system monitors the distance between the Hellcat and the vehicle ahead. If a possible forward impact is detected, it will activate the Advanced Brake Assist to help prevent impact. Adaptive Cruise Control is also offered with the 2018 model. This safety feature can automatically modify the set cruise speed to help you maintain a safe distance from the car ahead by engaging throttle control and brakes. Other available safety features include LaneSense Lane Departure Warning with Lane Keep Assist, a Blind Spot Monitoring System, and automatic high-beam headlights. The active front head restraints can help keep you safe during a rear-end collisions, and there are also airbags located throughout the cabin that include: advanced multistage front airbags, front seat-mounted side pelvic-thoracic airbags, a driver side knee blocker airbag, and full-length side-curtain airbags. In addition, the 2018 model was built on a solid safety frame that includes high-strength steel as well as superior roof strength for outstanding protection. 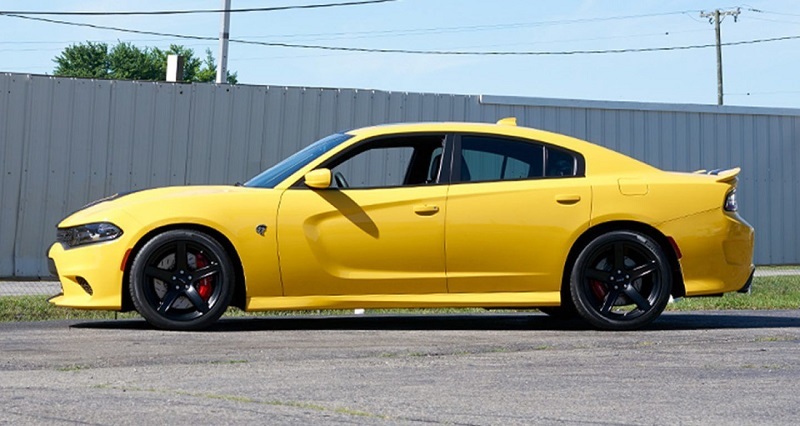 To take the 2018 Dodge Charger SRT Hellcat for a test drive, we welcome you to stop by Security Dodge on Westbury NY. We offer the 2018 Dodge Charger SRT Hellcat near Westbury NY. The 2018 Charger Hellcat is a top choice among consumers because of all it has to offer. Are you ready to check it out? If you are, our authorized Dodge dealership serving Westbury Westbury Massapequa Amityville NY can help get you behind the wheel of the SRT. To find out more information about the the innovative features that come with the 2018 Dodge Charger SRT Hellcat, visit us at Security Dodge serving Westbury Westbury Massapequa Amityville NY. We are an authorized Dodge dealership on Westbury NY.